Bring me a sweater, scarf, and a coat. I don't care how much we tote. Cause it's root, root, root for the Bears. At The Junior Giants ballgames. Coach Ben is in his element here, speaking of the weather and the sport! 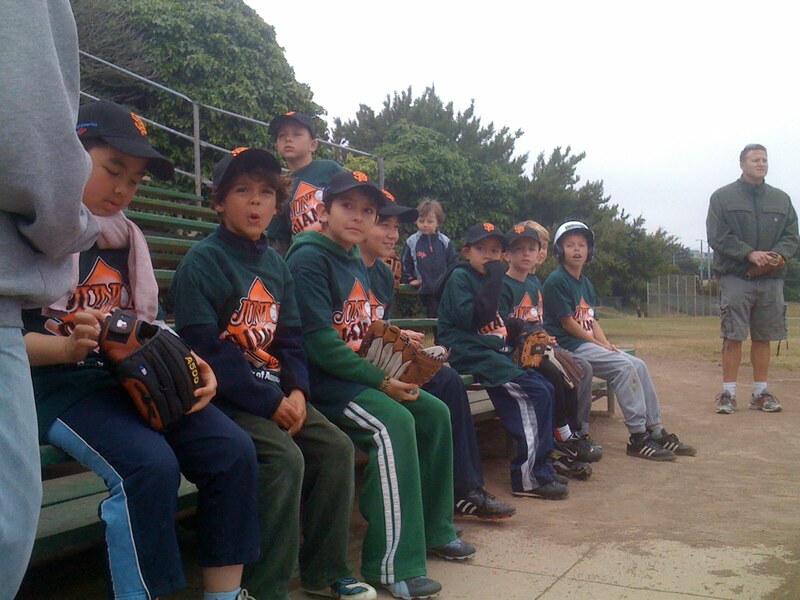 The Junior Giants Bears. Here them roar! Or Brrrrrrrr! Slugger Elijah warming up on deck. 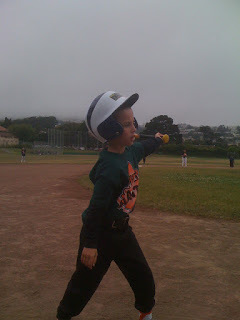 He gets out at first base and then later makes a base hit! And might I add that it's 4:15 pm, though it looks like 8:15 pm. The western part of the city sits in fog more often that our neighborhood making it cooler and more damp. It's an all new way of playing the all-American sport for us. So regardless the temperature and the wind speed, play ball!